Twelve years after his initial diagnosis his family, and his friends have become a vital part of the annual Winship 5K, running under the banner of Team Dave. When Dave Edwards was diagnosed with stage IV melanoma in 2005, he decided he would go to Winship for treatment and do everything his doctors suggested. Clinical trials? You bet. Novel treatments? Absolutely. His doctors started to catch on that this was a patient who was willing to do whatever it took to extend his life. "They threw the kitchen sink at him, if you will," says his wife Carolyn Edwards. "They knew Dave's tolerance level and chose the right path to keep him with us longer." Dave Edwards passed away on October 14, 2017. His daughter, Kelly Edwards said he was not a complainer by nature, and his optimistic outlook through years of treatment was no surprise. "My dad had a positive attitude with everything," she says. "He wanted to help find a cure and support other patients. He never faltered or hesitated." Twelve years after his initial diagnosis, Dave continued as a "regular" at Winship. He and his many friends, family and supporters became a vital part of the annual Winship Win the Fight 5K, running under the banner of Team Dave. Over the years, Team Dave has grown in numbers and impact. "It's pretty remarkable how many people have come together to bring more awareness to finding a cure and who support my family," says Kelly Edwards. 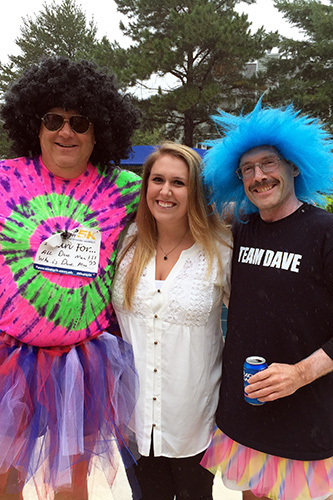 "Team Dave is not just a team that runs the Winship 5K; it's a group of supportive, fun, silly, and loving people who want something positive to happen to everyone who's fighting this unwanted fight. Go Team Dave!" 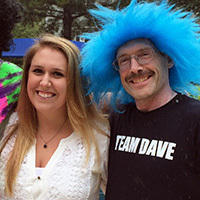 Dave Edwards (right) with daughter Kelly Edwards and a Team Dave member.